Have you seen Kaihan speak? Leave a review. 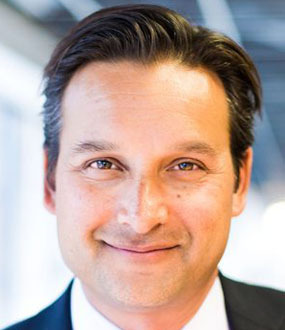 Top business strategy, growth, and transformation guru, Kaihan Krippendorff teaches companies how to tap into the resources they already have to produce breakthrough market-disrupting solutions. As the founder of the innovative consulting firm, Outthinker, Kaihan and his team have helped their clients generate over $2.5 billion in revenue, while simultaneously breathing new life into their businesses. Kaihan‘s extensive list of clients include Fortune 500s across every industry, the Consumer Electronics Association, National Association of Federal Credit Unions, Harvard Business Review, Wharton Business School, National Restaurant Association, Produce Marketing Association, FORTUNE Growth Summit, Young Presidents’ Organization, Entrepreneurs’ Organization, and the Institute for Management Studies, among many others. Kaihan is the author of four business strategy books and is currently working on a fifth. The Employee Innovator: Driving Innovation From Within (Columbia University Press, 2019) debunks the misconception that most market disruptions come from small start-ups and instead, focuses on the many overlooked innovations generated by large companies. 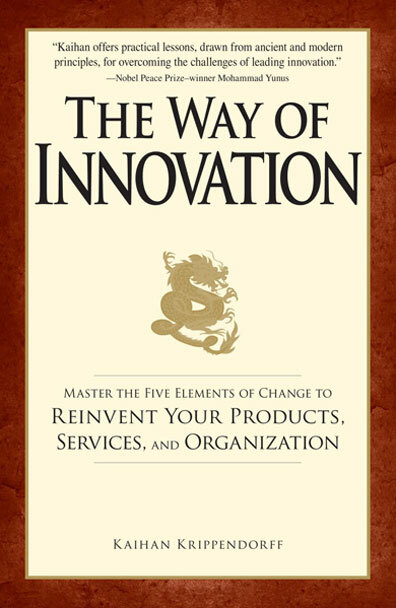 Kaihan’s latest research for the book breaks down what made it possible innovations to occur, what innovation blockers exist today for organizations, and how they can overcome these blockers with simple yet effective frameworks, tools, and techniques. Kaihan’s work is frequently featured in major news and business media outlets like Fast Company, BusinessWeek, Harvard Business Review, Forbes, Time, Fox Business, and PBS. Kaihan started his career off at McKinsey and Company. He quickly built a lasting brand for himself in business consulting circles due to his unique holistic approach and deep understanding of global markets and cultures. He speaks three languages and has lived or spent extended periods of time in Asia, Africa, Latin America, Europe, and the Pacific. 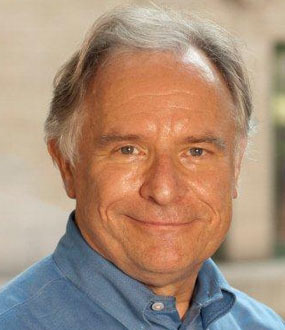 He holds a PhD in Economics as well as a Master of Business Administration from Columbia Business School. Kaihan Krippendorff is committed to helping organizations and individuals thrive in today’s era of fast-paced disruptive technological change. Kaihan is known for his ability to turn difficult concepts into easy-to-understand ideas that drive meaningful outcomes and actions. 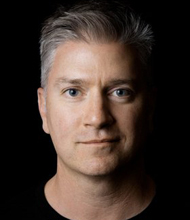 He is an internationally recognized thought-leader, battle-tested consultant, and sought-after keynote speaker on the topics of business strategy, innovation, creativity and growth. An accomplished author, Kaihan has written four books on business strategy, innovation, and creativity, most recently Outthink the Competition (John Wiley & Sons). 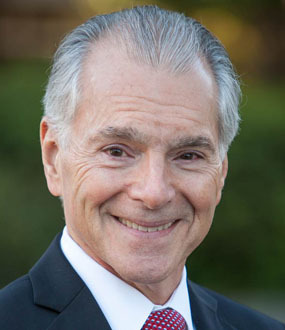 For his forthcoming book, The Employee Innovator: Driving Innovation From Within (Columbia University Press, 2019), Kaihan deeply researched and interviewed more than 150 internal innovators and leaders in nearly every conceivable industry. He earned a Master of Business Administration at Columbia Business School, a Bachelor of Science in finance from Wharton Business School, and a Bachelor of Science in mechanical engineering from the University of Pennsylvania, and he holds a Doctorate of Science in economics. Speaker and strategist Kaihan Krippendorff explains how his young son’s Lego rocket ship made him realize that the majority of us are looking at innovation the wrong way. When Krippendorff mistook his son’s creation for a tower, the boy quickly corrected him, clarifying that it could go underwater and pick up dinosaurs. The moment was a breakthrough for Kaihan, who notes that great innovators look at the pieces they already have, rearrange them, make something weird and different, and proudly stand by it. “We had assumed that we had to learn something,” Kaihan comments on what he now feels was a flawed approach to spurring innovative thinking. In-demand strategist and battle-tested “Outthinker,” Kaihan Krippendorff helps your people tap into their innate inability to think innovatively, increasing your business’ agility so that it can thrive in the Digital Age. Kaihan specializes in showing companies how they can disrupt their market without disrupting their own business. The seasoned consultant imparts a proven system that will enable you to better spot overlooked opportunities, produce breakthroughs with resources you already have, and leave your competition disoriented. Kaihan is a sought-after speaker and facilitator in a number of fields, including business strategy, disruptive innovation, agile-mindset, creativity, growth, and entrepreneurship. Working with Kaihan is easy and straightforward with no surprises. Kaihan incorporates his consulting experience into his speaking preparation. It can be expected that you will have at least one planning call before the actual event with Kaihan so he can ask questions and perform interviews that reveal the nuances of your industry, strategy, and vision. This allows him to craft a custom speech with a message that not only entertains and inspires but resonates with your audience. Kaihan’s team strives to exceed expectations for every keynote delivered. Anyone that has worked with Kaihan and his team will mention the great lengths they will go to in order to make your event a resounding success. As a successful entrepreneur, author, consultant and CEO, Kaihan has worked with and studied thousands of companies and the different approaches they take to drive growth, foster innovation, and set themselves apart from the competition. How is it that some companies are able to continually pivot their strategy, transform and pursue new growth ideas? The answer is they have a repeatable process and common language that can be learned and taught. “CONQUERING INNOVATION AND CREATIVITY KILLERS: DRIVING INNOVATION FROM WITHIN"
“Innovation” brings to our mind the maverick entrepreneur who quits their job, at unimaginable odds, to build a business on their own. But this entrepreneurial story is a myth. Kaihan argues that intrapreneurs – employees who incubate new businesses within corporations – have had a far greater impact on the world. Nearly all of the most transformative innovations over the past three decades, from e-mail and the Internet to DNA sequencing and MRI scans, were introduced by employees who did not quit their jobs but instead took the challenge of innovating from within. Drawing on five years of in-depth research of hundreds of successful innovators and Intrapreneurial Intensity, insights from thought leaders, C-suite leaders, business unit leaders, and front line employees – four time author, entrepreneur, and CEO Kaihan Krippendorff shares exclusive insights from his next book, The Employee Innovator: Driving Innovation from Within (Columbia University Press, 2019). Kaihan unveils the most common innovation barriers and shares specific tools, frameworks and techniques used by successful innovators to manage and unlock the value of employees’ ideas to drive corporate innovation levels and deliver bottom-line results. 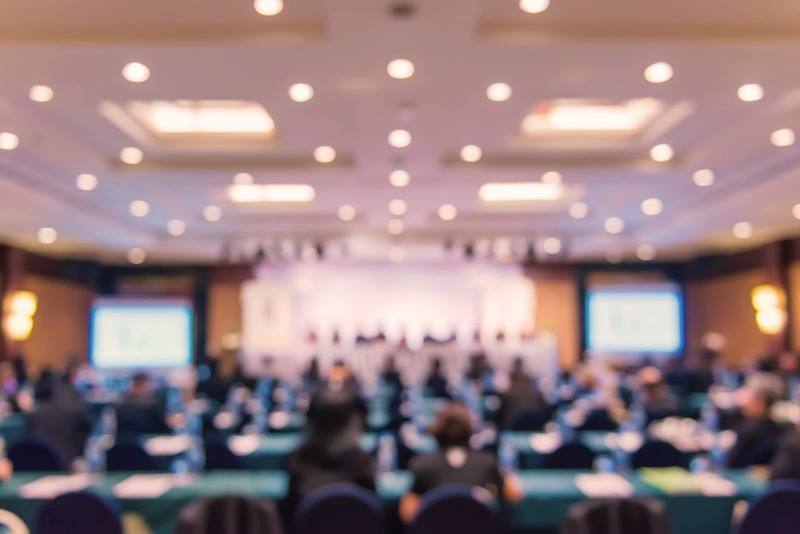 Audience members will leave feeling inspired and empowered with the actionable next steps for testing and scaling ideas that generate value and growth. •	Connect the unconnected – pulling together seemingly unrelated pieces of information to rapidly form a mental image of the situation or opportunity. •	Uncover unexpected causes – drilling down into the system to see the cause others overlook. •	Shift your frame – shifting your frame on the problem to reveal solutions others dismiss. •	Question the impossible – Why we fall into mental “traps” of false beliefs that prevent us from seeing what is possible and, more important, how to dig out of the trap that is keeping you from seizing the solution. We are experiencing a historic acceleration in the pace of change in our world. Artificial intelligence, digitization, robotics, 3D printing, social shifts, the rise of purpose-driven enterprises are reconfiguring how every conceivable industry operates. .
Four-time author, Entrepreneur, and CEO Kaihan Krippendorff’s proprietary research shows that today’s most successful companies more often speak of the strategic power of appealing to all stakeholders. If you design a strategy that benefits shareholders by also benefiting employees, the community, the country, and the environment, you have designed the ultimate strategy. When everyone wants you to win, you remove all competition. This idea goes beyond social responsibility. It points us toward removing the idea that doing good and making profit are inconsistent. You do not have to choose. Great speech. Inspired our sales team and gave them some unique tools and a framework to think about agile decision making and innovation. A must have for any conference or event focuses on growth and competing in the digital age! Fantastic speaker with amazing stage presence. Great insights into how my organization can approach the future and innovate. Entertaining and humorous. Kaihan spoke at our association's annual conference and crushed it! He shared great tools and insights for how we can not only think about, but take action to grow our businesses and adapt to the changing future. 10/10 fully recommend! Kaihan commanded the attention of the audience with insights from his amazing research in an entertaining and informative session! Kaihan is a uniquely engaging speaker; he energizes and inspires. He uses cutting-edge business examples to make complex subjects simple, and offers the right balance of entertainment and deep insight. We’ve exposed thousands of executives of growth firms around the world to Kaihan Krippendorff’s concrete and practical stratagems for dealing with competitive threats and he’s been universally well received by our tough and discerning audiences. 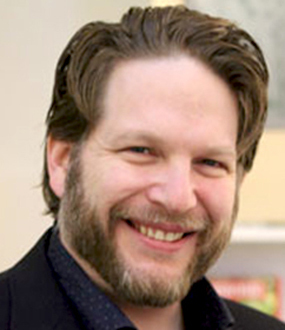 Kaihan Krippendorff breaks down the complex into relevant, practical, and actionable insights that engage, entertain, and inspire your audience. Instant information, immediate price comparison, and an expanding breadth of customer choice are thrusting business leaders into a new era of competition. Kaihan’s fresh message opens minds and motivates strategic change in an era that demands change. Kaihan’s speech for the Professional Convention Management Association left us inspired and wanting to change the world. We have had outstanding feedback from Kaihan’s sessions [at IMEX Frankfurt] and it was an honour to have him take part. Kaihan’s presentation was excellent, and highly rated by our membership. Not only did he educate and inspire us, but he left us with an actual framework to follow and engage our teams. Kaihan really understood the key messages we were trying to get across to our Senior Leadership team. He incorporated those key messages around strategy and innovation into his speech, which was energizing, practical and impactful. Kaihan is a great communicator, who held the rapt attention of an audience of more than 200 financial services professionals from across the country. He opened our minds, made us think, and gave us actionable ideas that one could apply to their day-to-day lives. Kaihan had over 700 business leaders captivated with his relevant content on how to build a business that disrupts your industry and distances yourself from your competition. He delivered! “Outthinkers” are entrepreneurs and corporate leaders with a new playbook. They see opportunities others ignore, challenge dogma others accept as truth, rally resources others cannot influence, and unleash new strategies that disrupt their markets. 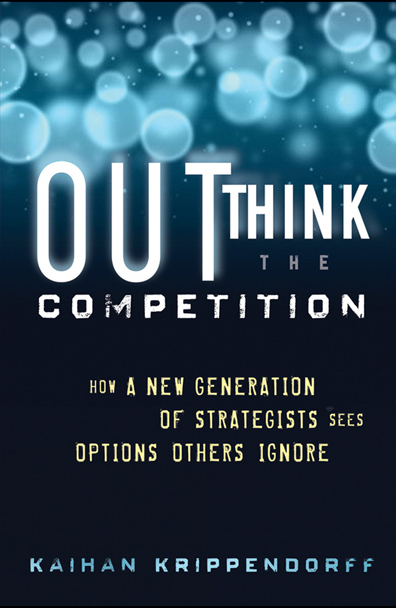 “Outthink the Competition” proves that business competition is undergoing a fundamental paradigm shift and that during such revolutions, outthinkers beat traditionalists. Business is warfare. Western business has been inculcated in the belief that business is about win/win solutions. However, in today’s global marketplace there isn’t fairness – there are winners and losers. Today’s competitive terrain calls for new tactics as well as an understanding of how your opponents approach the world. 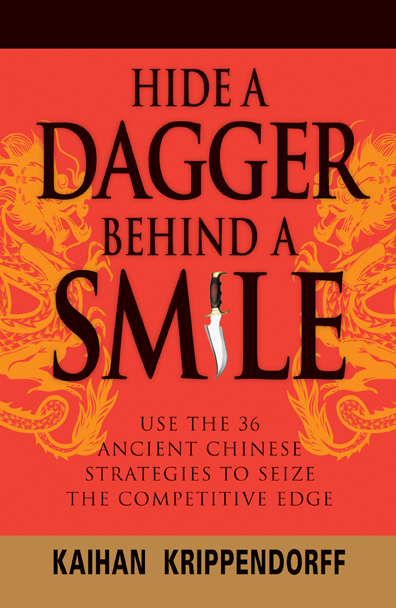 Using ancient Eastern philosophy and military tactics from The 36 Stratagems, Hide a Dagger Behind a Smile shows how to create unpredictable corporate strategies. Weaving the story of each strategy with contemporary case studies from top business and strategic management schools, each chapter analyses a company’s situation, options, decisions and results. The book is divided into four parts: Polarity – explores the balance of opposing forces; Yielding – illustrates alternatives to confrontations; Continuous Change – shows how to thrive in fluid situations; and, Indirect Action – proposes alternatives to head-on conflict. Hide a Dagger Behind a Smile is a timely and timeless resource for executives and corporate strategists looking to win their most contentious battles. Contrary to commonly held beliefs, strength and resources play minor roles in a company s ability to beat the competition. Instead, the ability to conceive of unorthodox strategies that the competition will choose not to copy is the key to gaining a competitive edge. In “The Art of the Advantage,” former McKinsey & Co consultant Kaihan Krippendorff captures a decade of study into corporate conflict. 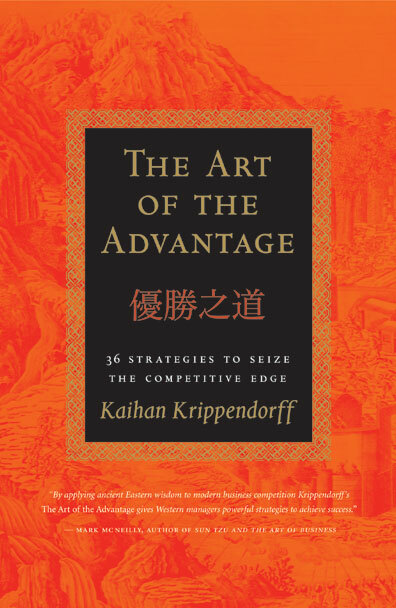 He shows that the fundamental patterns that successful companies have used to outmaneuver their rivals are rooted in a set of ancient Chinese warfare metaphors known as “The 36 Stratagems.” “The Art of the Advantage” marries these ancient principles with modern application through graphical depictions, ancient examples, and modern case studies. More than a traditional business book, “The Art of the Advantage” is a manual for systematically outthinking the competition.